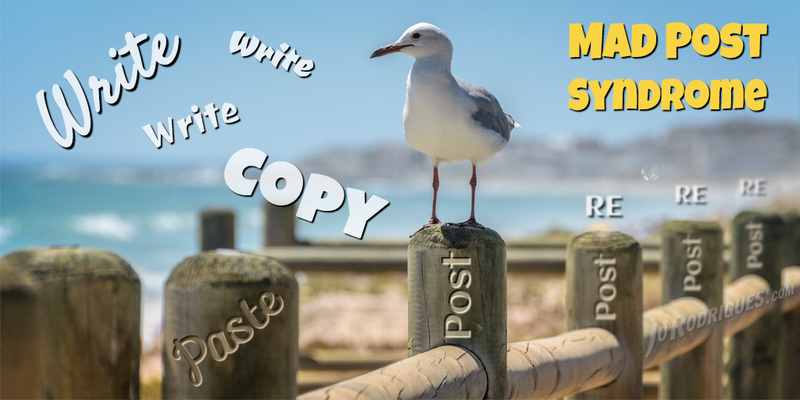 Write, copy, paste, post, and repeat senselessly. Is this what the new world is about? We post at each other, but where is the social aspect in that? The world is facing what I call ‘Mad Post Syndrome’. The text in posts has been replaced with images, then images with text, then images formally known as text with text formally known as jpegs, then text formally known as … what? How many new marketing strategies are people going to try? Urg! Enough …. We need to slow down the furious stream of nonsense that we are putting out. What are the aliens going to think of this race of morons constantly shouting at each other? The greater the noise, the louder everyone shouts. Me, me, me, mine … oh, wait. That was a seagull in Finding Nemo. Honestly, I urge everyone to stop contributing to the cacophony that no one wants to listen to. If you don’t want to be bothered with my contribution to the racket, why do you expect that I am listening to your commotion? I’m not taking any notice, and neither are you, so can we all please stop posting ‘at’ each other? I’m not ‘buying’ what you are selling so stop declaring that I cannot afford to pass on the opportunity. Stop telling me what to do and explain to me why I should buy your product. I don’t care that it is a bargain, because if you cannot convince me, I’m not interested. I care about why I need your product in my life. I also sell bits and bobs, but I’m not shoving them down your throat. The reality is that you don’t ‘need’ them, but you might be interested nevertheless. On Amazon, everyone is a best seller. I’ve also been a best seller. Some niggly little category on the bottom rung doesn’t make anyone important. It makes you a ‘nobody’ with everything to prove. If you are an author, write a good book, and then come back and tell me about it … not where I can buy it. I can figure that part out for myself. Post less and contribute more.